Not happy with what you see in the mirror? Always striving for an unachievable beauty target only to be left with disappointment and feeling of self hate? It’s a slippery slope and self-fulfilling – if you strive for an illusion of beauty you will never reach it. If you’re goal is to look like the girl in the beauty magazine, and you starve yourself and deprive your self of health, you will never reach it. And it’s not because you are not good enough to achieve it, it’s a standard of beauty that is not realistic. 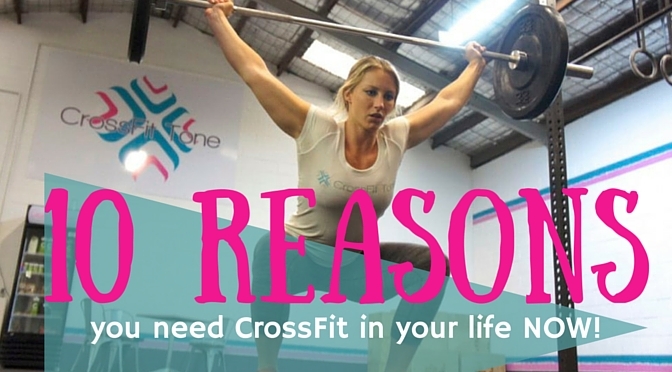 CrossFit however, offers you something tangible – health and real results. In CrossFit gyms around the world people are reaching goals every day, lifting heavier, running faster, doing a pull up. Reaching tangible results gives you confidence so you keep going, keep getting better and keep achieving. You no longer subscribe to a standard or beauty set decades ago but by a new standard being built today. Strong is beautiful and it is echoing all across the fitness industry and the world right now. CrossFit is designed to get you fit over all types of fitness: strength, stamina, cardio, endurance, power, balance, accuracy, coordination, flexibility and speed. It combines a series of weightlifting and gymnastics movements with monotonous movements like running, rowing, jumping etc to create the ultimate workout. The more you do it, the more skill you learn the more capacity to train you have the fitter you are. Fitness is your ability to work across these 10 areas. The better you are at each element, the fitter you are. CrossFit offers a very general and holistic way to look at health. It really pushes the idea that you need to fuel your body properly to train. Then you need to have good mobility (proper function and movement of your joint) to train at full capacity. Most people have terrible mobility mainly from our sedentary lifestyle or interestingly, sports like running. Being able to move and move well is one of the most important factors to longevity which isn’t covered often. So is nutrition and so is training at high intensity. CrossFit will teach you a lot about health and fitness you never would have previously known. CrossFit will change your body for the better. It will not only make you fitter, but will shape your curves , create a toned, healthy body. You will grow lean muscle and that muscle will burn fat, more that you can imagine! You will be able to move with ease, stand up tall and put your shoulder back proud of the body you have because you feel good in your self. CrossFit will make you happy. Health organizations recommend short, but very intense exercise to be the best for our physical and mental health. It’s the type that releases the most endorphins. CrossFit prides itself of intensity of it’s workout. Daily WODs (workout of the day) can be anywhere from 6-20minutes long. These short, intense burst of training provide great stimulus for your mind! Not to mention hanging out with your new CrossFit buddies and learning a whole bunch of new and exciting exercises! CrossFit teaches you to embrace your body no matter what. Your body is one of the greatest instruments you have in life and you need to treat it and maintain it in a way that you would an elite sports car. Providing your body with premium fuel and the best care. Sometimes you don’t realize how terrible you really feel. Are you tired when you get up in the morning? Need your sugar hit to feel normal? Have aches and pains? Bad skin, bags under your eyes? These are signs that your body is not being properly looked after. CrossFit teaches you the value of your body and to embrace it and treat it like the high performance machine it is. CrossFit is a great place to make buddies with people who have similar views are yourself. You are all about to do a workout together which enviably will be hard. In CrossFit you can all do the workout together, hurt together, get fitter together and help each other reach goals! Due to this commaradary, CrossFit is able to significantly boost your social life as you will make awesome friends who you admire and look up to. Imagine you are doing a really hard workout. Its tough, and you really don’t know how you are going to keep going. Out of the corner of your eye you see all the children in the crèche cheering you and all the other mothers in the class on yelling ‘go mummies go’ . What do you do? You keep going and you make your kids proud! You teach them perseverance is key to success! You become a better mother. Everything combined in CrossFit creates a really enjoyable experience. You get fitter, stronger, healthier so you enjoy your life more. The more you CrossFit, the better you become and the more you enjoy life. CrossFit has no limits on how fit you can be so if you just keep CrossFitting you’ll just get fitter and happier all the time!